The second recipient of the Pioneer Horseman Award is Daniel Gainey. Mr. Gainey established Gainey Fountainhead Arabians at Owatonna, Minnesota, following the gift to him of an Arabian colt in 1939. He developed a driving passion for breeding the finest and most beautiful Arabian horses possible and applied the same standards of perfection to selecting and breeding Arabians that he had applied to the jewelry design and manufacturing business of Jostens, Inc. (also headquartered in Owatonna). As a result, he developed a distinct Arabian type that was and still is recognized by Arabian breeders around the world.The name of the stallion Ferzon in synonymous with Gainey Fountainhead Arabians. Ferzon, foaled in 1952, was purchased from Frank McCoy when Mr. Gainey recognized the phenotype and genotype in this colt that he needed for his program. The cross between Ferzon and the lovely *Raffles daughter Gajala cemented the foundation of Mr. Gainey's program and provided four full sisters that were instrumental in his program. Mr. Gainey had the courage and vision to line breed for desirable traits and the ruthless standard of perfection that allowed him to cull individuals from the breeding program that did not meet his requirements. This allowed him to produce horses that would breed true to type for generations. Mr. Gainey was considered a breeders' breeder in that horses bred by him became the foundation of other breeding programs. Horses representing Gainey breeding provided foundation breeding stock for programs on 4 continents. Gainey Fountainhead Arabians were also well represented in the national show ring, including the National Champion Stallion Galizon., the multiple National Champion Gai Parada and numerous National Top Tens.Mr. Gainey was also influential in the development of the Arabian Horse Registry in America. He was a strong supporter on preserving accurate records and establishing strict guidelines to preserve the purity of the breed. 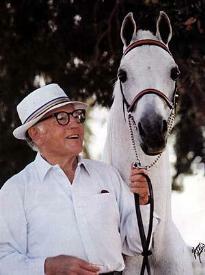 He was a director of the Arabian horse Registry from 1942-1973 and its president from 195 8-1973. The breeding philosophy and standard of perfection that Mr. Gainey developed over 4 decades of breeding Arabians has left an influence that will carry on for generations. Wherever Arabians are bred, trained or shown, Gainey breeding will be represented.